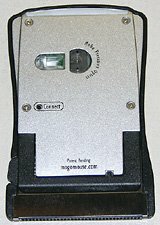 Side view of the Mogo Mouse BT™. I’ve wanted an ultra-portable laptop for a long time because lugging a heavy full-sized laptop around on trips was just no fun. 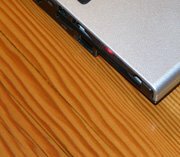 After much research, I had narrowed down the choices to a Toshiba Satellite U200-PT7 or a Lenovo 3000 V100. They were almost identical in features and price, and I settled on the Toshiba simply because it was immediately available locally (when I finally make up my mind what to buy, I want it now). For the first item, I purchased a nice small 18 ounce (500 gram) case made by Roots. A Compact Flash to PC Card adapter (which doesn’t require a cable) took care of the second requirement. The MoGo Mouse and an early Logitech corded optical mouse. The MoGo Mouse is just too cool. Newton Peripherals has created something that is exactly what I wanted: small, light in weight, easy to store, and exceptionally clever. This little mouse is the size and shape of a PC Card (formerly known as a PCMCIA card). 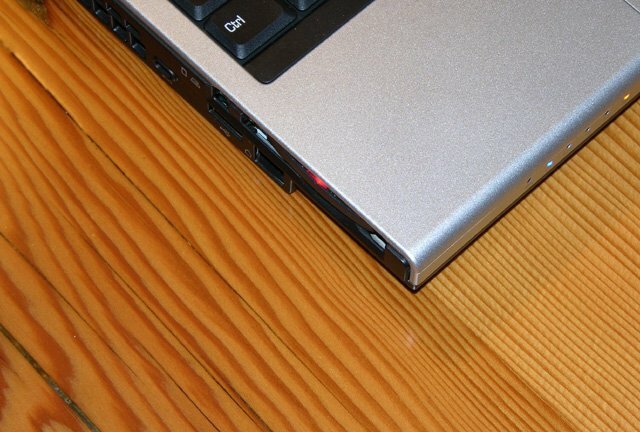 Most laptops, including my Toshiba Satellite, have at least one PC Card slot. In the past these were often used to add a wired or wireless network adapter to a laptop, although that’s all built into most laptops now. 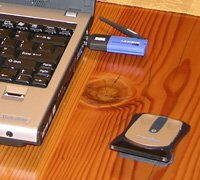 Other available PC Card devices include modems, memory cards, and even tiny hard disks (and of course the CF to PC Card adapter I purchased). But, the MoGo mouse isn’t actually a PC Card device, in the sense that it’s not intended to operate while it’s in the slot. 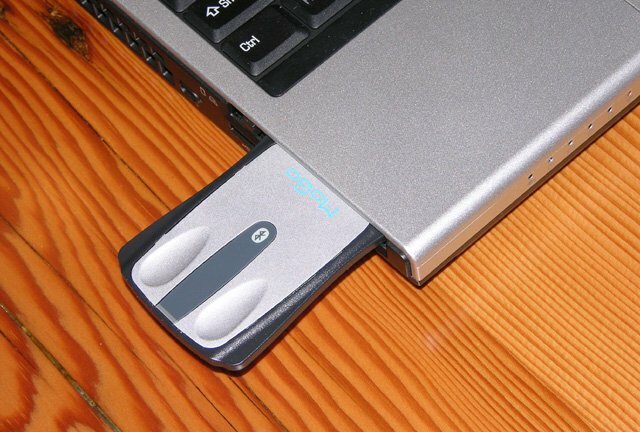 Instead, the MoGo uses the PC Card slot as a battery charger and storage container. When you’re not using the mouse but the laptop is on, just slip the mouse into the slot to recharge its internal battery. 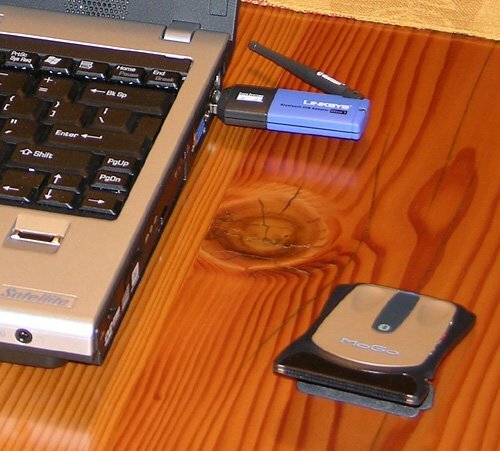 When you turn off the laptop and put it away, leave the mouse in the slot and you’ll always know where to find it. 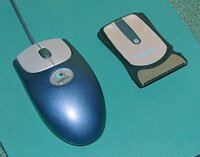 To use the mouse, just pop it out of the slot, flip down the “kickstand” which turns it on and makes it more mouse shaped, and then operate it like any other small mouse. My notebook runs Microsoft Windows Vista, which was not listed as a supported operating system. However, a quick e-mail to Newton Peripherals resulted in an assurance that it works fine with Vista, so I ordered one. The Connect button, as well as the optical sensor, are visible on the bottom of the mouse. The "kickstand" is folded flat in this photo. It arrived at my office, and I didn’t have my notebook with me that day, but I was anxious to try it out (after showing it to all my co-workers). Fortunately my desktop PC has a Bluetooth adapter (I use it to provide my Palm PDA with Internet access when I’m in the building). Getting the mouse working is almost trivial. I just had to press the “Connect” button on the bottom of the mouse, open the Bluetooth settings on my PC and tell it to “Add a Device”, and select the mouse from the list of devices found. After that, the mouse just worked. 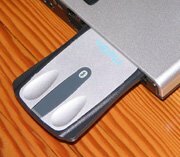 If you already have Bluetooth on your computer, there are no additional drivers to install. A few minutes later, the mouse’s status light started to flash red because the battery had run down. This is typical of most devices with a built-in rechargeable battery; it needs to be charged before first use (perhaps with Sanyo’s new Eneloop technology, it will soon be possible to sell devices pre-charged). Since my desktop PC doesn’t have a PC Card slot, that was the end of the fun for the day. Once I got home, I immediately inserted the mouse into the Toshiba’s PC Card slot to recharge. The status light came on red to indicate that the battery was charging. After supper and dishes, I came back to find the light was a solid green, showing that the mouse was now fully charged. I was surprised that my notebook didn’t have Bluetooth, so I used this LinkSys USB Bluetooth adapter. I then began setting up the Bluetooth drivers that came with my laptop. After the drivers had successfully installed, I got a message saying that the Bluetooth adapter could not be found. Some searching through the manual and Toshiba’s web site quickly brought to light the fact that this laptop has a built-in Bluetooth antenna, but no adapter! The Mogo Dapter™, available in the Fall of 2007. Luckily I had a spare LinkSys USB Bluetooth adapter handy, so I installed it. With that out of the way, setting up the mouse was once again trivial, and it just worked right away. The laptop’s touch-pad also continued to work even with the mouse active. Of course, the main reason I wanted a Bluetooth mouse was to avoid the hassle of having to unpack and then plug in a USB receiver to use the mouse (most cordless mice these days do not use Bluetooth, and require their own included proprietary receiver). Fortunately, Newton Peripherals is just about to release their MoGo Dapter, “the world’s smallest Bluetooth adapter”. Like other Bluetooth adapters, this one plugs into a USB port. But unlike any of the others, it only protrudes from the port by just a few millimetres, so it can be left installed when the laptop goes in its case. I plan to order one of these as soon as it’s available (Fall 2007). I’ve had the MoGo Mouse for a few weeks now and have a fair bit of experience using it. In short, it works extremely well. By it’s nature (PC Card form factor) it isn’t very big, but it’s surprisingly comfortable to hold and use. 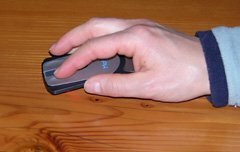 The MoGo Mouse fits well into the hand, with the fingers falling naturally on the buttons. 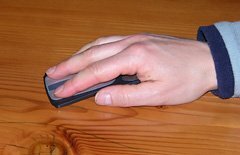 The sides of the mouse curve inward a bit, which gives a good grip and lets you feel where the mouse is in your hand without looking at it. Although the mouse is light at 1.5 ounces (41 grams), it feels substantial due to the small size for its weight (i.e. it’s very dense, which isn’t surprising considering what they had to pack in there). It’s also very well constructed, which no doubt contributes to the solid feel. The buttons have just the right amount of resistance that they are easy to press, without being so light that I press them accidentally. I’ve really only got two minor complaints about the MoGo Mouse: it has no third button, and it’s optical motion sensor is sometimes too good. To address the first shortcoming, Newton Peripherals informs me that they may release a custom mouse driver (or mouse firmware upgrade?) that will emulate the scroll wheel function of the third button when you hold down both buttons and move the mouse. 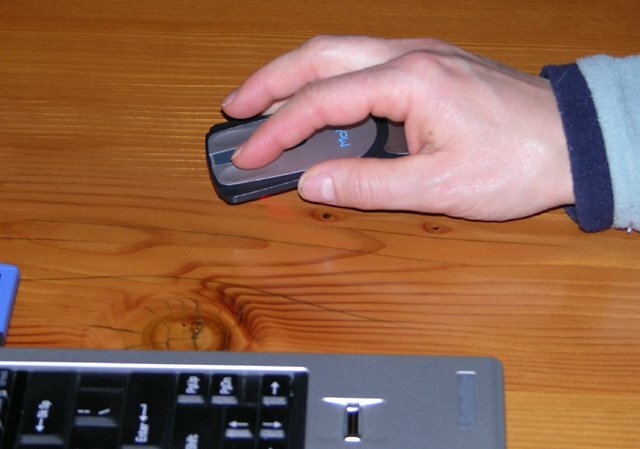 The optical motion sensor of the MoGo mouse has to be very good because unlike a traditional optical mouse, the motion sensor is a few millimetres above the desk surface when the mouse is in its operating configuration. If you’ve ever tried lifting an optical mouse while moving it, you’ll know that it won’t work if you lift it very high. Of course an old-style ball mouse won’t work if you lift it at all. This behaviour is actually desirable since it allows “pawing”, whereby you move the mouse, lift it, reposition it on the desk surface, and move it again, repeating as needed to get the mouse pointer to where you want it. 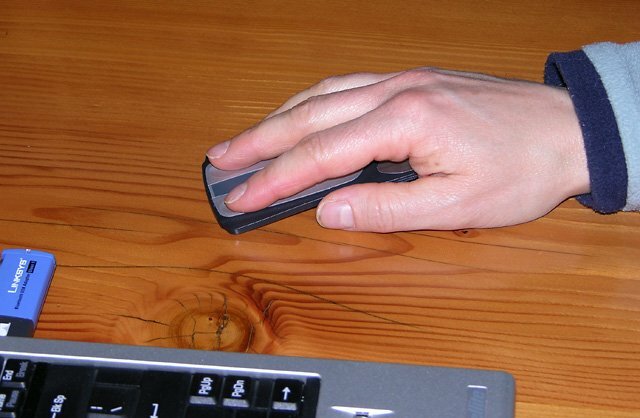 "Pawing" with the MoGo mouse requires lifting it slightly higher than other mice. To “paw” with the MoGo Mouse, you need to lift it a bit higher so that it doesn’t sense the motion when you’re repositioning it. It’s not a big deal, but takes a little adjustment of technique. Do I like it? Yes I do. This is one of the most well thought out devices I’ve ever bought. It’s easy to set up, easy to carry, works well, and is comfortable to use. The fact that I decided to keep it despite the fact that I currently have to use an external Bluetooth receiver due to my notebook’s unexpected lack of a built-in one is telling. It would have been just as easy to return it and buy a cheap traditional notebook mouse. If I had purchased the Lenovo laptop, Bluetooth would have been built-in. But the Lenovo doesn’t have a PC Card slot. Instead it has an Express/54 slot, the new replacement for the PC Card standard. 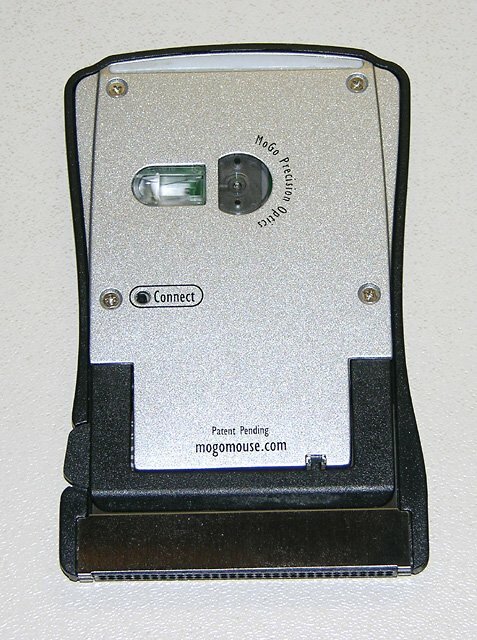 Newton Peripherals has an Express/54 version of this mouse in the works, slated to be released in August of 2007. Due to the odd shape of an Express/54 card, it will be interesting to see how well the Mogo Mouse X54 is received. Well, I don’t have the time to design such a charger, but presumably it’s just a matter of supplying +5V and ground on the pins that the PCMCIA cards use for this, since the actual “smarts” for the charging circuitry is inside the mouse already. I really like your article very much.especially your suggertions are very useful to me.thank you very much sir.